A small scrap bundle of stripe fabric has been sitting on my cutting table since finishing my stripe quilt earlier this month, awaiting my next move - use it or bin it. I love working with these stripey fabrics, and this time decided to cut the fabric pieces on the diagonal (off-grain); more wasteful (of fabric) than anticipated but a fun variation. I did have to call upon some stash fabrics to add variety. The finished product is a pillow cover, basted and quilted with edge to edge diagonal lines (cross-hatched). One of the great things about a small project is that the basting is not a chore, and the quilting is no hassle. 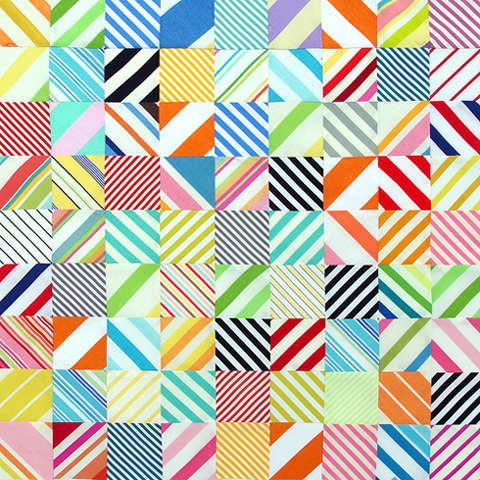 It goes a long way in re-setting my enthusiasm for making larger quilts. The pillow cover includes a zippered side seam for easy insert removal and cleaning. For the back of the pillow cover I have used heavier weight home decorator fabric from the Authentic collection by Sweetwater which I have been zealously hoarding for the right project. This was it! My fabric motto for 2013 is Use it or Lose it! I have listed this pillow cover in my Etsy Store. 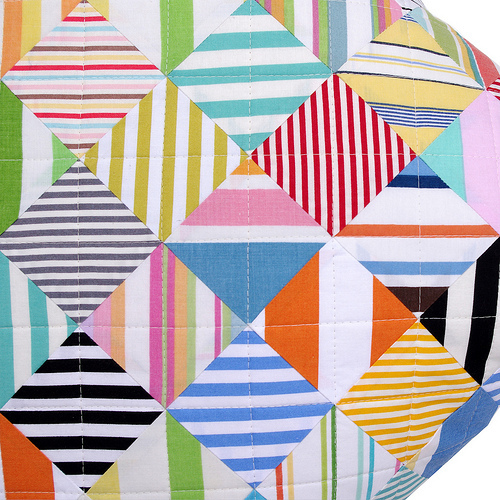 You can find the listing here: Modern Patchwork Pillow Cover. A nice way to end this Australia Day long weekend as well as start a new week. Superschön! Ich liebe Streifen und die Idee, sie diagonal anzuordnen, bringt noch zusätzlich Lebendigkeit rein. Und wie immer bei deinen Quilts, Rita, eine sehr frische Ausstrahlung. I'll try it in English: Awesome! 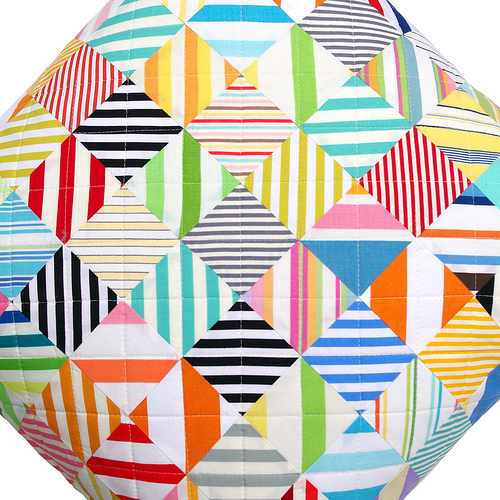 I love stripes and your idea, to put them into the diagonal adds a lot of liveliness. And as always with your quilts, Rita, this pillow looks very fresh. Oooh! This I love! Incredible how just turning the stripes on point makes such a difference. It's lovely! Thanks for the inspiration. 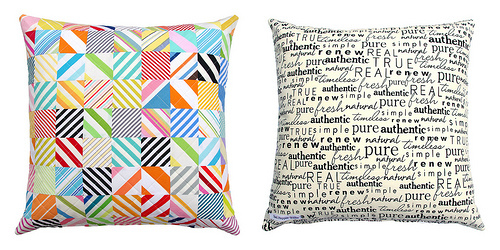 I need to make a pillow cover today and it really should be fun. You make it look fun! these are so so cute! love the birght colros and fun patterns! I'm a stripe fanatic too! LOVE that pillow!! Love the strips! So fresh and they could definitely brighten up any room. I also love the fabric with words. Can you share where you bought it? Thanks for sharing your creativity with us! It is hard to express how much I love this. It is visually stunning. Maybe even more so than the quilt becaus word the scale. You are always amazing. I just love you work. You have a great sense for color. Love your pillow- although I'm not surprised. I love seeing what you are up to. Really beautiful! Not surprised at all it has sold. oooooooooo - so pretty! I love it! Love yer blog! I wanted to let you know that I have mentioned you on my latest blog post inviting my readers here to your blog. 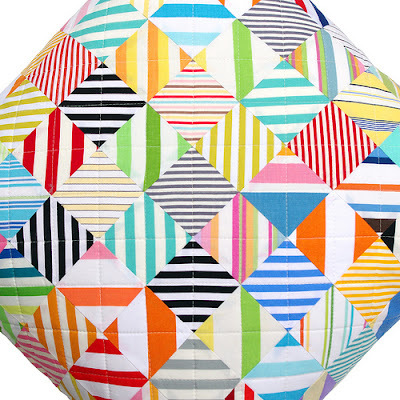 Keep up the amazing quilting! Stunning and SOLD already--love it. Your stripes excite me and inspire me too; many thanks. 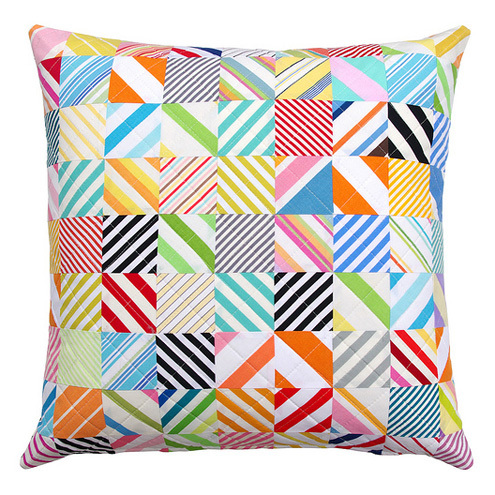 Love the pillow ~ sure did sell fast! I am in awe at your precision piecing whilst fabric is on the bias. Amazing! If you should lose it, you could lose it to me :) I like the combination of the stripes and text.